In the 1940's Joe Kropf started a plumbing business based on the east side of Detroit. It expanded over the years with various divisions and our portion (Kropf Service) was officially started in 1977. In early 2000 we added the Mechanical part of today's name Kropf Mechanical Service Company to reflect that we not only service heating and cooling equipment, we also design, sell and install all types of mechanical equipment related to our industries needs. Owners David Williams and John Edwards, along with the office staff, have over 100 years of combined experience in the business. Kropf Mechanical Service Company provides HVAC and temperature control service and installation to the commercial industrial and institutional marketplace. Kropf Mechanical Service Company brings a total team effort to every project by utilizing the knowledge, experience, and technical expertise of our professional staff. Kropf's service technicians are provided with state-of-the-art service equipment, allowing the technician to analyze the problem and solve it accurately. Our service manager works closely with the service technician and the customer in an effort to maintain customer satisfaction. This coupled with our total team effort has gained Kropf Mechanical Service Company a reputation of quality and reliability in the marketplace. 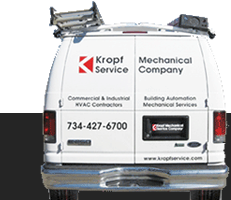 Since 1977 Kropf Mechanical Service Company Has provided the commercial and industrial marketplace with heating and cooling service installation, control systems, and energy management.